Elektron’s latest compact groove station takes a welcome new look at FM. The Digitone marries a four-part FM-synth engine with Elektron’s much lauded performance sequencer. 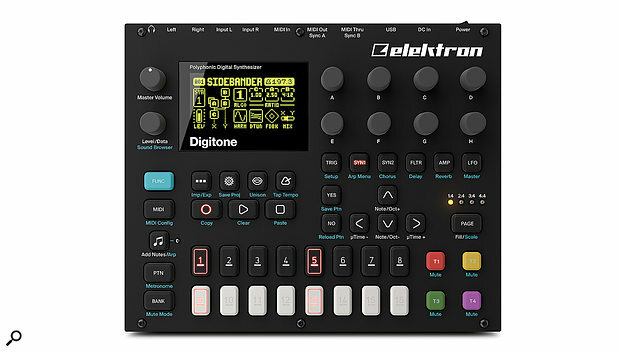 Despite loving most of what Elektron do, I noticed a curious air of ‘meh’ in my own reaction to the Digitone’s launch. A little introspection revealed an ugly truth I’d not acknowledged about myself: I’m a bit FM-ist. Maybe it’s because I started my journey into synths and audio production in the early ’90s, when every studio seemed to have a dusty DX7 standing against a wall, as past-it as rolled-up jacket sleeves. But then at Superbooth I wandered onto Elektron’s booth and braved the communal demo headphones to check out what all the fuss is about. Oh mummy; a couple of presets in and I was all beardy grin. Not a lifeless electric piano, half-assed flute or lazy bell to be heard, just a gorgeous wash of crystalline synth beauty, warm clarity, and solid low end that goes down forever. I should have known better, I love these types of sounds; looking through my DAW projects from the last 15 years I’ve put FM8 in nearly every one in spite of myself. So what exactly is the Digitone all about? Fundamentally it’s an FM synth workstation, offering four-part multi-timbrality with eight voices. You could treat it as a sound module that — when Overbridge arrives — will offer discrete outputs for each synth track over USB. Overbridge will also give you remote control, recall and automation of the whole machine via a plug-in. But all this would be missing out on half of what the Digitone has to offer; the real fun is to be had working directly with it hands-on, building multitrack patterns and performances with the internal sequencer. If this sounds conceptually like an FM version of Elektron’s Analog Four you’re close, although the Digitone is all digital and incarnated into the same body and price range as the Digitakt performance sampler (reviewed last September). The only significant physical difference between the Digitone and the Digitakt is that the 16 trig buttons have been squeezed horizontally to make room for dedicated track selectors. These buttons exhibit a rare use of colour by Elektron, visually differentiating ’tone from ’takt, and making an already desirable form factor, well, adorable. The rear panels are the same, with stereo in, out and headphones on quarter-inch jacks. MIDI is catered for impeccably with full-sized In, Out and Thru, or can transmit via the USB connection that’s also there for the very overdue Overbridge computer link. Power is supplied by an adaptor. Happily the Digitone also worked with my secret weapon: a portable UPS/charger which has a DC output as well as the usual USB. I bought this gadget to power my Zoom field recorder, but it also works with Elektron gear and other bits of my kit like my 0-Coast synth and gave me three to four hours at a time of garden-based noodling. The Digitone has the same wonderfully tactile panel controls as the other new generation Elektron instruments, with the big clicky buttons that make you feel important. I’ve probably said enough previously about the lack of velocity-sensitive keys on Elektron’s boxes. It didn’t really bother me here, and when at home I had a Launchpad Pro plugged directly into it for more expressive playing. There’s the same high-contrast, chunky display that exemplifies Elektron’s ‘future retro’ aesthetic. And the Digitone has the latest, smooth Elektron encoders. I really appreciate the shape and grippy texture of these encoders: you can spin them continuously from the top edge, which is great for things like scrolling through a patch list. The Digitone shares the same back panel connections as the Digitakt: a 12V power socket, a USB port, MIDI In, Out and Thru ports and quarter-inch stereo inputs, outputs and headphone out. The Digitone’s compact panel presents you with two rows of ‘trig’ buttons for playing and step-sequencing sounds, and for recalling patterns. Alongside these are the four track selectors which move the whole panel’s focus between the four synth tracks, or the MIDI tracks if the MIDI button is engaged. The eight main encoders always take their function from the current screen view, which is selected from the various other buttons across the panel. All controls for the current synth track and the Pattern’s effects are quickly accessible from the buttons below the encoders. Work on the Digitone takes place inside Projects, which are home to eight banks of 16 patterns, plus a working pool of 128 sounds. The internal storage (‘+Drive’) holds your projects and a master sound patch library. Each pattern within a project is a more-or-less independent entity, with its own track sound assignments, tempo, effects settings, etc. With no samples to think about, Digitone is easier to understand and use than some of its siblings. You can just jump directly into the master sound browser and pick a sound for a track, either from the flat list or filtering by tags. Once a sound is loaded into a pattern it becomes part of the project’s pool, and you can make changes freely without affecting the original. You can also tag and export sounds you’ve made to the top-level library so they’re available in other projects. The sound library came pre-loaded with two banks of presets that do a great job of demoing the range of sonic possibilities. There are a few nods to patches from the classic DX and TX oeuvre, but mostly they’ve gone for a more modern electronic palette. Mostly when I dipped into the library it was to load up drum and percussion sound starting points. For synth sounds I was keen to start from scratch and see what I could do. The conventional view is that FM synthesis is not very user-friendly. Yamaha’s DX7 usually gets blamed for this, although to be fair it was probably the lack of general understanding of its synthesis that got in the way as much as its one-parameter-at-a-time programming method. My personal issue with FM is that sound design can seem semi-random, with relatively few combinations of settings producing sweet spots. Elektron have evidently thought long and hard about how they’d like to make an FM synth and attacked both the usability and sound-taming issues head on. OK, quick recap: in FM synthesis complex tones are generated by frequency modulating simple oscillators with other audio rate oscillators. The nature of the resulting sound is determined by the relative pitches of the oscillators (usually called ‘operators’ in FM) and the amount of modulation. Different sounds can be obtained by patching the operators together in different ways, adding modulation feedback loops, and tapping audio from different places. Within any routing scheme (or ‘algorithm’) the user can normally adjust the frequency ratios of the oscillators and the intensity of modulation. 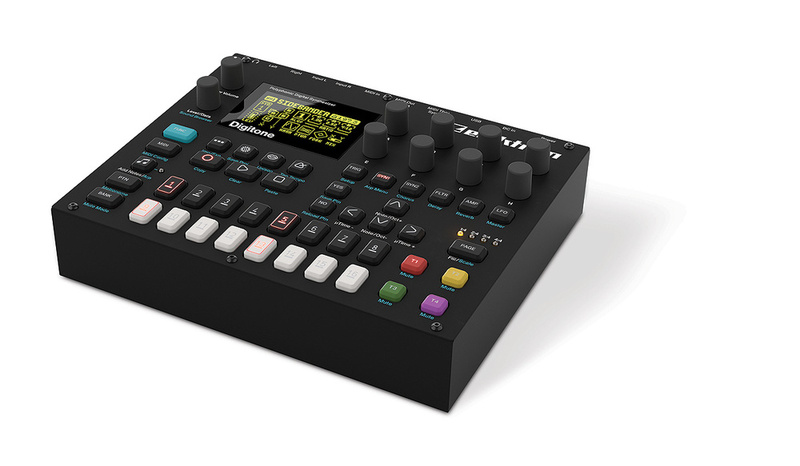 Fundamentally, the Digitone’s synthesis follows the classic DX7 paradigm, but Elektron have simplified both the structure and user control system. The Digitone keeps to four operators, patched as eight different algorithms (the DX7 had six ops in 32 configurations). Two of the oscillators are paired together and frequency scaled from a single encoder, so just three encoders are required to set all the frequency ratios within a patch. Probably the most significant design decision Elektron have made is to limit the ratio values to multiples of 0.25. This weights the outcomes towards tonal, harmonically coherent timbres. That’s not to say you can’t get into the harsher territory that FM offers, and there’s a Detune control that progressively offsets the ratios of two of the operators. All of these core controls are on a single page, which still has room for more parameters. One encoder lets you move the oscillators away from traditional sine wave operators. Turned in one direction this morphs the main carrier, in the other it reshapes two of the modulators. A Feedback control drives the self-modulation loop in each algorithm, while a Mix knob blends the sound between the main carrier output and one of the other operators. A second synth control page (again with a dedicated button) lets you control the amount of frequency modulation coming from the two modulator sources (the ‘A’ operator and ‘B1/B2’ group). These default to zero, so new sounds comprise pure tones until you start cranking these encoders. Both FM levels are paired with dedicated envelopes which, rather than taking the regular ADSR shape, comprise Attack, Decay and End Level stages. I occasionally wished the two FM controls were on the same page as the ratios, but it does make sense for them to live alongside the envelopes that control them. A secondary page in the SYN2 settings lets you set an initial onset time for either of the envelopes, something which I employed often both to add longer movement to pads and create nice double-strike percussive sounds. From here you can also decide whether each envelope’s Attack stage resets to the zero position when triggered, or picks up from the current position. 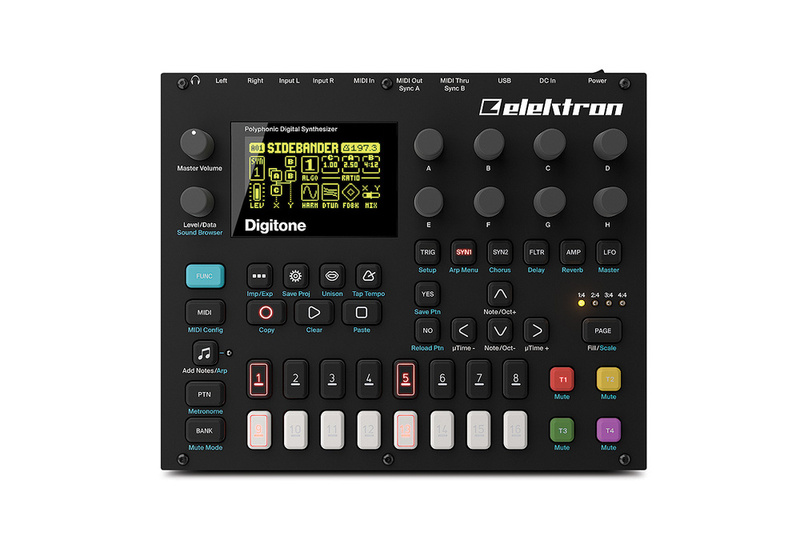 Another inspired decision Elektron have made with the Digitone is to pair the core FM sound-generation engine with a more conventional subtractive sound-shaping architecture. There’s a multimode envelope-controlled filter offering 2- or 4-pole low-pass or high-pass modes, all with resonance. On top of this, though, each voice has a simple low- and high-pass filter pair. Thank you! There are so many occasions when I’ve wished synths offered this. With the Digitone you can fine-tune and tame a sound with the band-limiting stage and still have the more funky filter to play with. After the filter you have a standard Amp envelope and a nice Drive effect. All tracks in a Pattern share Chorus, Delay and Reverb as send effects (and you can send to the Reverb from the Chorus and Delay) and there’s final stage Overdrive for some subtle warmth and boost. Sharing the same dimensions as the Digitakt, the Digitone’s front panel measures 215 x 176 mm. On the modulation side, each track has two LFOs that can be assigned to any destination within the Synth, Filter or Amp parameter pages. In addition, LFO2 can modulate any of LFO1’s parameters. I regularly found the LFOs made all the difference between a pretty good sound and a really good sound on the Digitone. It might have been nice if the LFOs were able to smoothly modulate the operators outside of their 0.25 quantisation, but they can’t. The resulting zipper-stepped results are interesting in themselves, though. The FM amounts, Filter and VCA have dedicated envelopes but there are no extra, assignable envelopes, and there were occasions where I’d have liked one. However, you can draft in an LFO for similar duties, as they have trigger modes and a start phase control. As well as the LFO, each track has a page for setting up how it responds to MIDI velocity, mod wheel, aftertouch, etc. Mod sources can be assigned and scaled to up to four parameters at a time. You can also assign keyboard scaling separately to all the individual modulator operators. All track parameters except the Arp can also be controlled via MIDI CC message, and I’ve seen this used on other Elektron gear with hardware MIDI panels for extended performance control. Stand-alone, for performance modulation, I’d have liked a Macro mod encoder page where you could map other parameters (or groups of parameters), perhaps from any track in a pattern. Sequencing on the Digitone is again the same as on the other Elektron instruments. When no record mode is active the trig buttons act as a chromatic keyboard for playing the active track. (If you define a diatonic key/scale for the track, off-key notes are disabled). In Live Recording mode you can record directly into the sequencer, with or without quantisation. In Grid Recording mode, patterns are created or edited using the X0X convention with the trig buttons displaying 16 steps at a time. A dedicated Trig control page lets you define the parameters of new triggers, or edit existing ones. Notes can be edited here freely, or scale-constrained using a visual keyboard and the cursor keys: up and down changes notes, left and right adjusts micro-timing. You can also transpose a whole track quickly. Patterns are up to 64 steps in length, and you set each track independently within the Pattern. You can change the playback speed per pattern to adjust the resolution or to accommodate triplets or different time signatures, but you can’t set different speeds per track. Motion sequencing, parameter locking, automation or whatever you prefer to call it can be achieved in real-time or step by step. In Live Recording mode, all your encoder twiddling and settings changes will be captured. In Grid Recording you can simply hold down a step and make changes that you want to apply only on that step. The FM algorithm itself is p-lockable, which makes for some fun dynamic possibilities, and you can also recall complete sound patches from the project’s sound pool on any step. This can be used for random craziness but is particularly useful for creating a mixed drum pattern on a single track. If you need a little sequencing assistance or inspiration, each Digitone synth track (but not MIDI track) has its own Arpeggiator. This is a slightly simplified version of the excellent multi-mode Arp on the Analog Four. Per-step pitch offsets and loop length control make it much more useful than a standard simple arpeggiator. I started a lot of Patterns by Live Recording a simple, held chord progression, then engaging the Arp and fiddling with the settings until I got something interesting. In recent times we’ve seen plenty of synths with built-in sequencers, but the Digitone can justly claim to be a full-on groovebox without damaging its synth cred. For a start, with four independent synth tracks and sound locking you can squeeze a lot into a Pattern. And its sound engine is especially good at drum and percussion sounds. I quickly settled into a routine where I’d just whack in a quick sequence, leave Live Recording running while messing with the sounds, add some kick and hats, and build a track across half a Bank, using patterns liberally for variations and song sections. I’d then jam and record out an arrangement to my recorder or computer in real time, switching patterns, using Track muting and tweaking the sounds and effects, etc. Then there are MIDI tracks. These are four more sequencer tracks for external gear. I connected up my ever-present 0-Coast synth to the MIDI Out, and brought the audio back into the Digitone via one of the external inputs. Externals connected this way really feel like extra tracks integrated in the box, and they get the benefit of the Digitone’s effects and fluid performance-sequencing environment. This whole workflow is inspiring and has transformed the way I want to do things: I can bash out a tune in the time it would normally take me to get through updating my plug-ins. One thing I found restrictive was the lack of Direct Jump/Temp Jump pattern-change modes. These modes are available on the Analog Rytm and Analog Four, and allow for instant pattern changing in step with the current beat position. As with the Digitakt (and, even more surprisingly, the Octatrack) even though you can choose how long any given pattern plays before pattern switching occurs, queued patterns always start from the beginning. Direct Jump is such an effective way to quickly create variation, fills and breaks that it’s frustrating not to have it. What you do have, however, is ‘conditional locks’, another Elektron speciality. This is the option to add logical conditions to any step in a sequence that determines whether or not it will play. The simplest example is creating Fills. It’s a quick process to add steps to any pattern with the Fill condition attached. These steps are then ‘revealed’ when you press the Fill button during playback. Alternatively (or additionally), you can use conditional locks to automate variations, glitches or repeats in patterns, for example by assigning a percentage chance of certain trigs playing, or having them play or not play depending on whether a previous step fired, etc. The Digitone was a real surprise. My initial skepticism was heavily dented as soon as I heard it. What I fell in love with was the speed at which you can get results and build ideas. I’ve never produced so much music during a review. Elektron have a particular way of doing things across all their devices, which can be a frustrating learning bump to get over at first, but ultimately rewards you with a uniquely enjoyable hands-on performance workflow. The Digitone’s sound engine is a clever implementation of FM synthesis, keeping the core goodness of the DX7, but simplifying it (actually in a similar way to Yamaha’s own Reface reboot) and hybridising it with subtractive filtering. It rethinks the sound programming side, giving you everything you need on just two banks of encoders, and gently steering you toward musical results. Yes, these design choices do slightly reduce the sonic range compared to synths with more operators with fully granular control, but they are choices that make the Digitone a joy to use instead of a science project. I’m at a loss to think of any direct comparisons. On a tighter budget Korg’s Volca FM would provide some of the same goodness as the Digitone, albeit one sound at a time and with three voices. Yamaha’s Reface DX recreates the DX7 in miniature, with similar compromises to the Digitone (eight voices, four operators, fewer algorithms). It’s primarily a synth, though, with limited sequencing capabilities. Dynamic and inspiring sequencing/performance workflow. MIDI tracks and audio inputs for integrating other gear. Two filter stages per voice. Eight synth voices might be limiting for some players. No instant pattern take-over mode. Four tracks of accessible yet sophisticated and great-sounding FM synth in an eight-track Elektron performance workstation.